If this will be your first time here, be prepared for a crowd. 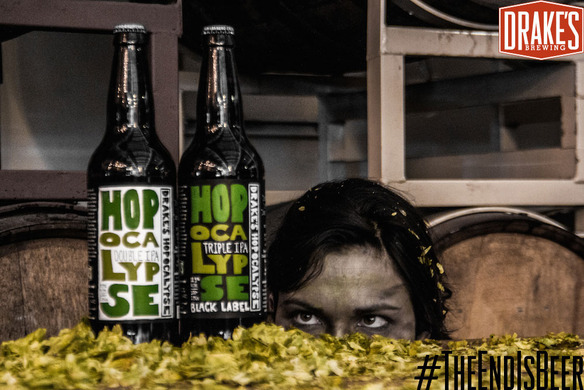 Hopocalypse is by far our largest yearly event, and it’s showing no signs of slowing down. It can be cold here in the mornings & evenings, so if you’re coming real early or staying real late, dress appropriately. •Drake’s Barrel House doors will open at 10am. •There will be no parking in Drake’s lot– it’ll all be covered by the event. Please take transit (AC Transit 89 from BART) or a cab, or park in the main Westgate lot. •The entrance will be across from the brewery, near the bottom of the large ramp (like with First Fridays). If you’re approaching from Walmart’s main entrance, make a left around the corner with all the shopping carts. •There will be a limited amount of Hopocalypse Brew-Rhino kegs available upon opening, but we expect them to be gone very quickly. 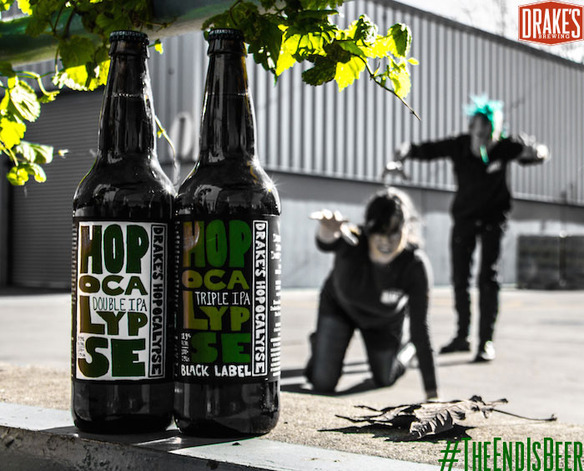 •For bombers, there’s a two-bottle limit for Hopocalypse Black Label, and a one-case limit for Hopocalypse Green Label. Growler limits will be 2 for Green Label and 1 for Post-Hopocalypse. We will not offer growler fills of Black Label. •Non-Hopocalypse retail will be shut down until late in the evening, so if you’re wanting to stock up for football, do so before or after the event (we’ll be open noon on Sunday). •Bring water- we’ll have some available, but you can never have enough. Leave the pets at home, too. Kids are okay, but keep them close. •Fiveten Burger, our own Brew! Kitchen, Nosh This Chocolates, and Highwire Coffee will all be here with slightly less Hopocalyptic offerings (including a Jolly Rodger truffle from Nosh This). •We’ll also have the DB Walker Band at noon and DJ Toph One at 3pm. The D.B. Walker Band is a versatile Blues and Rock unit that is guaranteed to entertain. The band plays a broad variety of original material and classic rock favorites that get audiences involved, creating a party atmosphere in any venue. DJ Toph One, leader of SF’s Red Wine parties, will be laying down an all-vinyl set of punk, metal, and classic rock. During the month of February, we’ll select one winner each week with the best plan, to be named leaders of the Hopocalypse and among humanity’s best chances for survival. 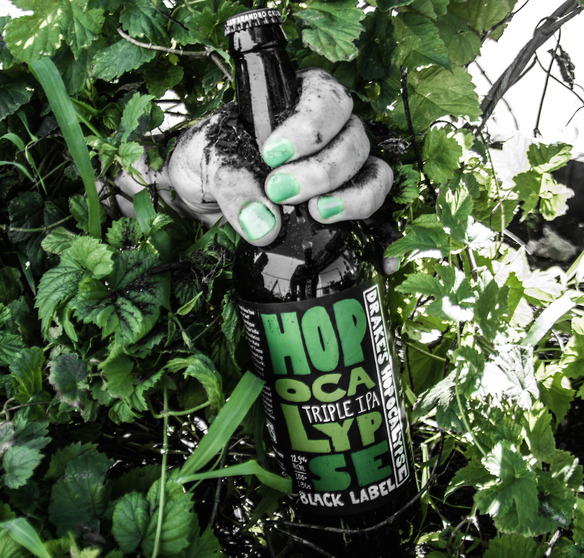 Winners will receive their own Official Drake’s Hopocalypse Survival Kit and automatically be entered to win a trip to the brewery for day of brewing and beer fun with the Drake’s crew. For more information on the contest or the release event, visit endisbeer.com. Good luck, friends, for it seems… The End is Beer. Like this post? It’s pulled straight from our January newsletter. Sign up at the top right corner of the page to keep on top of the latest big news from us. We promise no spam, unless we find out it pairs well with 1500.